Mobile devices have forever changed the workplace and the parameters of the CIO role and IT functions. Can CIOs successfully bridge the gap between ensuring security of company data while allowing employees to bring their own devices? 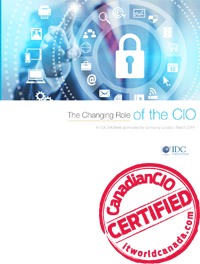 Download this IDC infobrief, sponsored by Samsung, to learn what CIOs see as their top priority and how they are successfully resolving this issue. Learn why bring-your-own device programs lead to great employee engagement and what CIOs can do to ensure the security and privacy of data and devices. Understand how Devices have changed the CIO role.